The teaching materials for the learning experience on “Commandments” are divided into three parts. In part 2, students will study this doctrinal topic using information in the Doctrinal Mastery Core Document. They will learn about the Word of Wisdom and the Lord’s commandment to teach the gospel to others. They will also study the doctrinal mastery passages found in Doctrine and Covenants 89:18–21 and Doctrine and Covenants 18:15–16. Write the following key statement of doctrine on the board: God’s commandments include observing the Word of Wisdom and teaching the gospel to others. Divide students into pairs. 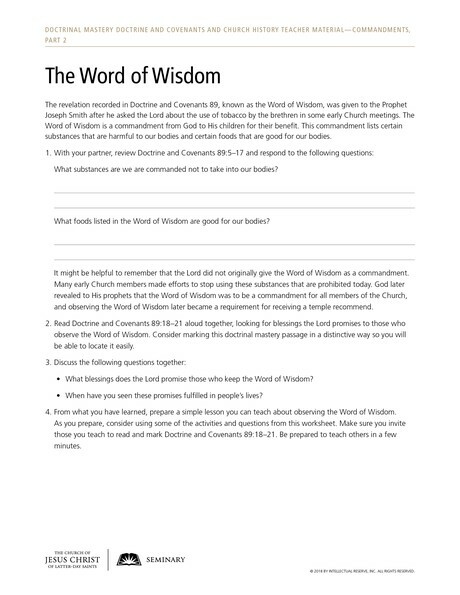 Give copies of the handout “The Word of Wisdom” to half of the pairs in class, and give copies of the handout “Teaching the Gospel to Others” to the other half of the pairs in class. Ask students to work together with their partner to complete their worksheet and to be ready to teach about their assigned commandment. Explain that they will have 10 to 15 minutes to prepare. The revelation recorded in Doctrine and Covenants 89, known as the Word of Wisdom, was given to the Prophet Joseph Smith after he asked the Lord about the use of tobacco by the brethren in some early Church meetings. The Word of Wisdom is a commandment from God to His children for their benefit. This commandment lists certain substances that are harmful to our bodies and certain foods that are good for our bodies. What substances are we are commanded not to take into our bodies? What foods listed in the Word of Wisdom are good for our bodies? It might be helpful to remember that the Lord did not originally give the Word of Wisdom as a commandment. Many early Church members made efforts to stop using these substances that are prohibited today. God later revealed to His prophets that the Word of Wisdom was to be a commandment for all members of the Church, and observing the Word of Wisdom later became a requirement for receiving a temple recommend. Read Doctrine and Covenants 89:18–21 aloud together, looking for blessings the Lord promises to those who observe the Word of Wisdom. Consider marking this doctrinal mastery passage in a distinctive way so you will be able to locate it easily. What blessings does the Lord promise those who keep the Word of Wisdom? When have you seen these promises fulfilled in people’s lives? From what you have learned, prepare a simple lesson you can teach about observing the Word of Wisdom. As you prepare, consider using some of the activities and questions from this worksheet. Make sure you invite those you teach to read and mark Doctrine and Covenants 89:18–21. Be prepared to teach others in a few minutes. The Lord has declared, “I give unto you a commandment that you shall teach one another the doctrine of the kingdom” (see D&C 88:77). With your partner, list some situations in which you have seen people teach the gospel to others. The Lord’s commandment to teach the gospel applies to all of us, even if we don’t currently have a formal calling as a teacher. We have opportunities to teach in our families, with our friends, in our Church classes, and in our interactions with coworkers and neighbors. Sometimes we teach with words, and sometimes we teach by example. Tell your partner about the last time you taught the gospel to a person or group. Shortly after the Prophet Joseph Smith and Oliver Cowdery received the Aaronic and Melchizedek Priesthoods, the Prophet received a revelation about their responsibility to share the gospel and to declare repentance to the world. Read Doctrine and Covenants 18:15–16 aloud together, looking for blessings that come from helping someone repent and come closer to Jesus Christ. This scripture is a doctrinal mastery passage. Consider marking it in a distinctive way so you will be able to locate it easily. What is the blessing of teaching the gospel that is described in Doctrine and Covenants 18:15–16? Have you ever experienced joy from sharing gospel teachings with someone else? Why do you think you felt this way? What opportunities do you think you will have today or tomorrow to teach the gospel to others? It’s your lucky day! You have an opportunity to teach the gospel very soon. Prepare a simple lesson with your partner to teach what you have learned about this commandment to teach the gospel to others. As you prepare, consider using some of the activities and questions from this worksheet. Make sure you invite those you teach to read and mark Doctrine and Covenants 18:15–16. 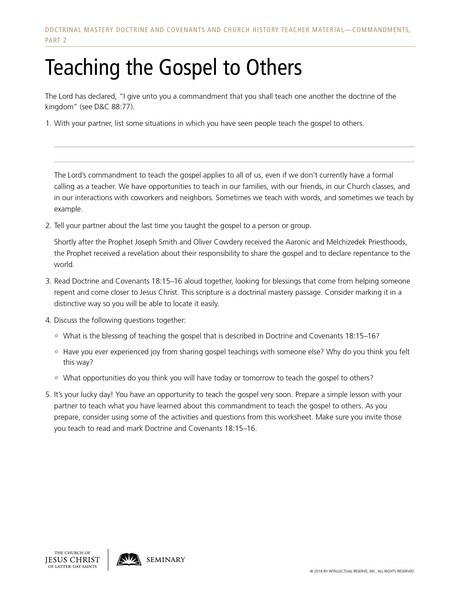 After students have had time to learn together and are prepared to teach, invite partnerships who studied “The Word of Wisdom” handout to teach partnerships who studied the “Teaching the Gospel to Others” handout, and vice versa. If your class is small, you might invite the partnerships to teach the class. Share your own experience and testimony related to these two commandments. 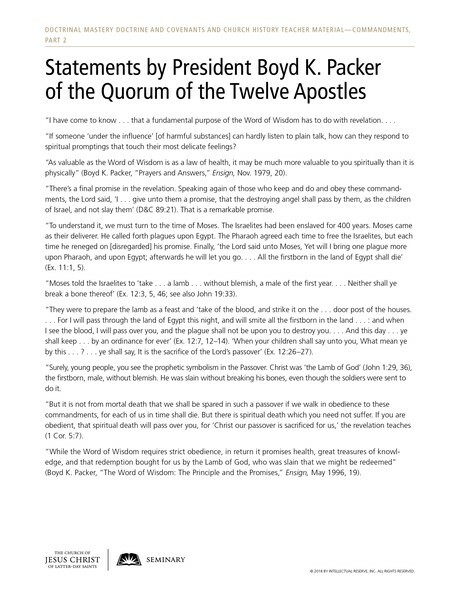 To help students better understand the promises and blessings of keeping the Word of Wisdom recorded in Doctrine and Covenants 89:18–21, provide students with the accompanying handout of statements by President Boyd K. Packer (1924–2015) of the Quorum of the Twelve Apostles. Invite several students to read the paragraphs aloud. Ask the class to follow along, marking the promises President Packer mentioned. “If someone ‘under the influence’ [of harmful substances] can hardly listen to plain talk, how can they respond to spiritual promptings that touch their most delicate feelings? “As valuable as the Word of Wisdom is as a law of health, it may be much more valuable to you spiritually than it is physically” (Boyd K. Packer, “Prayers and Answers,” Ensign, Nov. 1979, 20). “There’s a final promise in the revelation. Speaking again of those who keep and do and obey these commandments, the Lord said, ‘I … give unto them a promise, that the destroying angel shall pass by them, as the children of Israel, and not slay them’ (D&C 89:21). That is a remarkable promise. “To understand it, we must turn to the time of Moses. The Israelites had been enslaved for 400 years. Moses came as their deliverer. He called forth plagues upon Egypt. The Pharaoh agreed each time to free the Israelites, but each time he reneged on [disregarded] his promise. Finally, ‘the Lord said unto Moses, Yet will I bring one plague more upon Pharaoh, and upon Egypt; afterwards he will let you go. … All the firstborn in the land of Egypt shall die’ (Ex. 11:1, 5). “Moses told the Israelites to ‘take … a lamb … without blemish, a male of the first year. … Neither shall ye break a bone thereof’ (Ex. 12:3, 5, 46; see also John 19:33). “They were to prepare the lamb as a feast and ‘take of the blood, and strike it on the … door post of the houses. … For I will pass through the land of Egypt this night, and will smite all the firstborn in the land … : and when I see the blood, I will pass over you, and the plague shall not be upon you to destroy you. … And this day … ye shall keep … by an ordinance for ever’ (Ex. 12:7, 12–14). ‘When your children shall say unto you, What mean ye by this … ? … ye shall say, It is the sacrifice of the Lord’s passover’ (Ex. 12:26–27). “But it is not from mortal death that we shall be spared in such a passover if we walk in obedience to these commandments, for each of us in time shall die. But there is spiritual death which you need not suffer. If you are obedient, that spiritual death will pass over you, for ‘Christ our passover is sacrificed for us,’ the revelation teaches (1 Cor. 5:7). “While the Word of Wisdom requires strict obedience, in return it promises health, great treasures of knowledge, and that redemption bought for us by the Lamb of God, who was slain that we might be redeemed” (Boyd K. Packer, “The Word of Wisdom: The Principle and the Promises,” Ensign, May 1996, 19). What do President Packer’s statements help us understand about the promised blessings of the Word of Wisdom? Note: The following review activities are not intended to be taught during the same class session as this lesson—“Commandments, Part 2.” Please present these activities during seminary class sessions that take place after you have taught this lesson, but before you teach “Commandments, Part 3.” These short reviews can be taught at the beginning or end of classes in which you teach a regular sequential scripture lesson from the Doctrine and Covenants. Be sure that these reviews take no longer than the designated time, so as not to take away from the scripture block students will be studying in class. Provide students with a sheet of paper. Ask them to write the number 89 in the middle of the paper. Then invite them to create a picture or pictures using the number 89 to depict the meaning of Doctrine and Covenants 89:18–21. For example, students might make the 8 or the 9 (or both) into a picture of someone running without weariness or someone opening a treasure chest. Or students might draw pictures on the paper surrounding the number 89. These pictures could represent the promises described in the doctrinal mastery passage. (You might want to explain that the purpose of this activity is to find interesting and creative ways to remember this doctrinal mastery passage, and not to assess their drawing skills.) After about five minutes of drawing, invite students to volunteer to show and explain their pictures. You might post some, or all, of the pictures in the classroom so students can be reminded of where to find the promises for obeying the Word of Wisdom. Write the following key statement of doctrine on the board: God’s commandments include teaching the gospel to others. Invite students to turn to and read silently Doctrine and Covenants 18:15–16. Ask them to explain the meaning of the passage and how it supports the statement on the board. Students could do this with a partner or with the entire class. Suggest to students that they could remember this reference by associating it with the age that young men become eligible to serve full-time missions (18). Ask them how they might remember the verse numbers. You could use some of their suggestions to review this scripture in the future. How might you remember this scripture reference? How could you remember what it talks about? What does it explain about one of the Lord’s commandments? Invite students to work with a partner and answer these questions about each of the following doctrinal mastery scripture passages. Provide these passages one at a time to the class by writing them on the board.